In 2006 Fabio Cannavaro was named FIFFA World Player of the Year, an he is the last defensive player to do so. The same year he won The World Cup with Italy. As a player he represented his country 136 times, scoring twice. He won domestic trophies in Italy and Spain playing for clubs like Napoli, Parma,Inter Juventus and Real Madrid. At Parma he also won the UEFA Cup. Tonight he will face another Italian giant, Roberto Mancini, a man with 25 trophies under his belt, 13 as a player in Sampdoria and Lazio, the other 12 as a manger in Fiorentina, Lazio, Inter, Manchester City, and Galatasaray. He scored more than 200 goals in more than 700 games in Italy. For the national team he netted four times in 36 appearances, winning the bronze medal on home soil in The World Cup in 1990. As a manger he won three league tittels in a row with Inter, before he became the first manager to win the league with Manchester City in 44 years back in 2011. 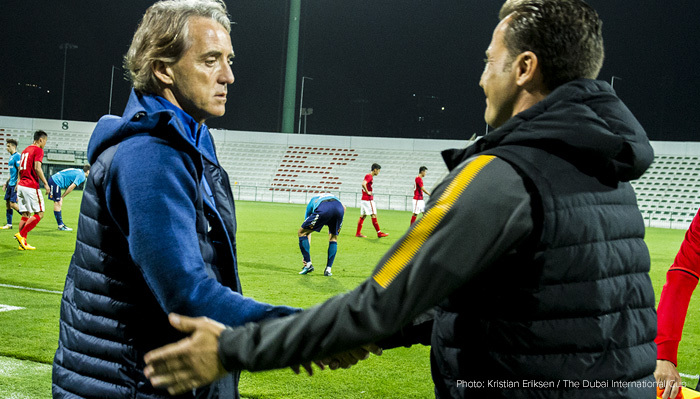 Fabio Cannavaro`s Chines side have managed two draws so far here in Dubai, 3-3 against Brøndby and a scoreless draw against FC Copenhagen, while Mancini`s Russian side have been very impressive, winning 5-0 against FCK and 5-1 against Slavia Praha. The match tonight is all about prestige for the two Italians.